Minis Program (U5, U7, U9 & U11) is the largest and most successful in North America, producing many past, current and, most certainly, future Ontario Provincial and Canadian International players! Join the Crusaders Minis program and become part of an inclusive playing and socially active volunteer based club that has been leading the way in Canadian club rugby since 1968! The Crusaders Mini Rugby Program is a fun way to introduce and develop the joy of rugby in a friendly and safe environment. By developing the principles of love of physical activity, team work, and the skills of rugby at early ages, we are aiming to ingrain strong values and skills that can be used throughout a lifetime and career. Mini rugby is the start of a long term development model of a successful rugby player, or for some, simply the beginning of an enjoyable and healthy fulfilling lifestyle. We are proud of our committed volunteer coaches that work hard to create a fun and respectful learning environment whilst at the same time giving our Minis players a solid grounding in the wonderful sport of Rugby, one of North America’s fastest growing grass level sports. Throughout the season CRU runs many social events, from Victoria Day Fireworks display to BBQ’s, touring team games to watch and a very socially vibrant clubhouse and deck where players and family are welcome to enjoy hot summer days and warm evenings watching rugby activities. At the Crusaders you will be part of a club, not just a team! The U5/7/9 program provides a safe environment where kids can begin capturing great rugby memories. U5/7/9 Flag puts FUN in rugby fundamentals. Flag Rugby is a fun and exciting form of non-contact rugby suitable for boys and girls of all ages and abilities. There are no scrums, line-outs, or tackling allowed in flag rugby. Flag rugby is an excellent way of being introduced to some of the basic skills of rugby such as running, passing, and catching in a fun and safe environment. The focus of the program is on fun, physical movement, and teamwork, with an overarching goal of developing an understanding of the game. Skills that will be focused on throughout the year will be running, passing, catching, creating space on attack, and alignment on defense. These requirements mean that every player must move with and follow the play in order to be involved and support their teammates in order for the team to succeed. In rugby, at any level, rarely can one player take over or control a game. Rugby is a true team sport and needs everyone’s participation, dedication, and team work in order to succeed. These skills will be developed in training, fun exercises, game simulations, and through the various festival tournaments that we will be involved in. The Crusaders U5/7/9 program is an excellent place to increase a child’s overall skill development and knowledge of the game in a risk free environment. We are part of great rugby community and show our support by participating as spectators and honour guards at home games for Team Canada. Participation-based coaching that encourages equal playing time. Kids would rather play on a losing team than be on the bench for a winning team. Open door for parents to participate and to share their observations. We can talk all you want before or after practice and games. Let’s keep the focus on the kids during practice and games. Training – 9:00 – 11:00 AM Saturday mornings. The last festival is at end of August, but additional rugby is planned for the Fall. The Crusaders Mini Rugby Program is a fun way to introduce and develop the joy of rugby in a friendly and safe environment. By developing the principles for the love of physical activity, team work, and the skills of rugby at early ages, we are aiming to ingrain strong values and skills that can be used throughout a lifetime and career. U11 rugby is the start of a long term development model of a successful rugby player, or for some simply the beginning of an enjoyable and healthy fulfilling lifestyle. 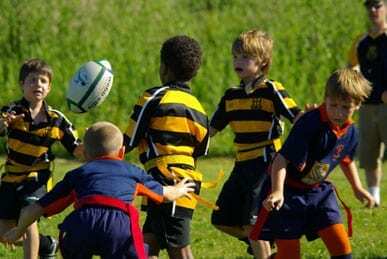 The U11 modified contact rugby program is co-ed welcoming boys and girls and will build on the development gained during the U5, U7 and U9 programs. It introduces more of the aspects and skills of the full game in a controlled and graduated manner. We welcome children who are new to rugby. This is a perfect age to start and they will find that, within a very few weeks, they are able to fully participate in the training program, scrimmages, games and tournaments. While the focus of the program is on fun, physical movement, and teamwork, with an overarching goal of developing an understanding of the game; we also want children to have the opportunity to develop strong fundamentals for rugby through knowledgeable coaching. In order to ensure a child’s best chance for success, our coaches are provided with appropriate training and resources, and many of our coaches are former and current senior players. In rugby at any level, rarely can one player take over or control a game. Rugby is a true team sport and needs everyone’s participation, dedication, and team work in order to succeed. These requirements mean that every player must move with and follow the play in order to be involved and support their teammates for the team to succeed. Skills that will be focused on throughout the year will be running, passing, catching, creating space on attack, and alignment on defense. These skills will be developed in training, fun exercises, game simulations, and through the various festival tournaments that we will be involved in throughout the season. The Crusaders U11 program is an excellent place to increase a child’s overall skill development, knowledge of the game and level of fitness. Mouthguards are mandatory for all training sessions and games. Low cost home molded mouthguards can be obtained from any sports shop for approximately $10 – $40. A dental technician or doctor fitted custom mouthguard is highly recommended. They are far less bulky, fit precisely and stay in place (cost approximately $45 – $80). Rugby or soccer cleats are required. Soccer cleats are most common. Please avoid or replace metal studs as they provide no advantage on hard fields and frequently injure other players. The Crusaders will be providing club jerseys, please be patient with our suppliers. No glasses / eyewear or jewelry are allowed at training sessions or games as they can potentially cause injury.